The A303 will not be dualled through the Blackdown Hills, Transport Secretary Alistair Darling has said. Instead, an alternative route from Ilminster to Taunton will be upgraded. Business leaders who backed the A303 plan, called it a "black day for Devon and Cornwall", saying it was crucial to the economic future of the region. 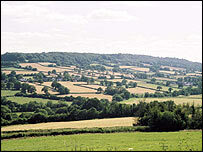 But environmentalists preferred a dualling scheme for the A358 to protect the Blackdown Hills, a designated Area of Outstanding Natural Beauty. The shorter preferred route will cost about £248m, £90m less than the projected cost of dualling the A303 through the Blackdown Hills. The Highways Agency will now work up the scheme in detail, but no start date has been set. Mr Darling made the announcement following months of technical work to assess the impact of improving the A303 or the A358. He said: "This decision reaffirms the government's commitment to add road capacity where necessary, whilst ensuring that environmental consequences are fully considered and mitigated. "Improving the A358 will protect the Blackdown Hill and bring real benefits to the region - reducing journey times for tourist and business traffic heading to and from the South West." But Devon County Council called the decision "a major blow to the region". Councillor David Morrish, executive member for the environment, said: "We were reassured a decade ago when the Blackdown Hills were considered for designation as an Area of Outstanding Natural Beauty that this would not affect the planned road dualling. "However we now find that the same designation has been given as a reason not to progress the scheme." Tim Jones, of the Devon and Cornwall Business Council, said: "This is a black day for Devon and Cornwall's economy. "The M5 is already congested and we have desperately lobbied for a second arterial road. "The new road could have created about 8,000 jobs and at least £200m. That will now be lost. "We all understand that the environment is precious to us all and good for business, but there has to be a compromise somewhere." Transport Minister David Jamieson, retorted: "This investment is seriously good news. "I am just sorry that someone from the West Country business community is talking this down."